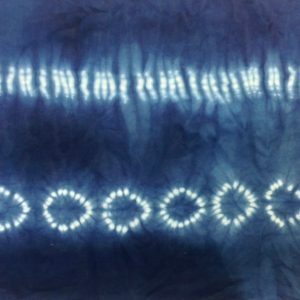 The Indigo shibori workshop that I participated in during early July was a continuation of my exploration of dyeing techniques. 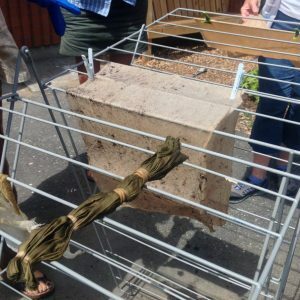 I had already tried a few Natural Dye pots, and also, some Eco-printing. Attempting an Indigo vat, without some guidance was quite intimidating. Therefore, I enrolled in a 5 day workshop at the Haliburton School of Art, with Harriet Boon. My friends’ place, where I was staying for the week was a half hour drive to the school. Each morning was a treat, driving on windy roads, past many small lakes, before reaching the small town of Haliburton. One morning I came upon a young black bear, who was retreating into the woods. At the workshop, there were only 11 students. Everyone had some kind of artistic background in various techniques. We were also of varying ages and came from different areas of Ontario. 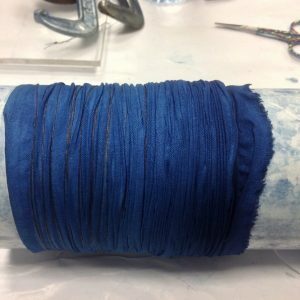 As a result, our level of production was extensive and our interest in Indigo shibori dyeing was earnest. Initially, we split into 3 groups, to experiment with a few natural dyes: tea, coffee and walnut husks. Both the tea and coffee results came out as a warm, though faint brown colour. 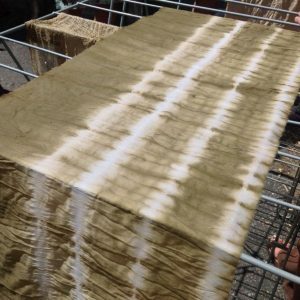 The walnut husk dye turned the fabric a rich olive green; however with time this has become a caramel brown colour. 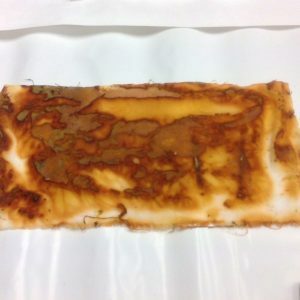 Rust dyeing was our next experiment. 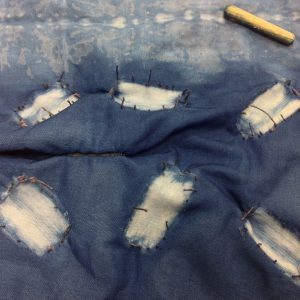 This involved placing various rusty objects such as nails, steel grommets, old farm implements etc onto cotton and silk fabric. 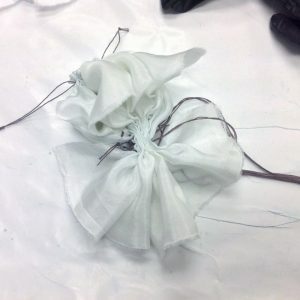 They were sprayed with vinegar and wrapped in cellophane. These bundles were left for 24 hours. On some of the samples, distinct imprints of the various objects could be seen, in various ranges of sepia tones. Interesting. But, as a group, we agreed that this was not our cup of tea. In the afternoon, we made our Indigo vats. We paired up to make the vats. The smell, the colour, the indigo bloom- our excitement was noticeable! We carefully skimmed off the bloom, trying to not stir the vat too much. 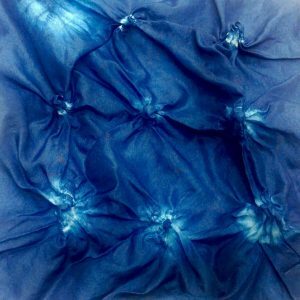 Our first attempts with Indigo shibori were with simply tied fabrics of our choosing. I used a white, nicely textured cotton fabric. 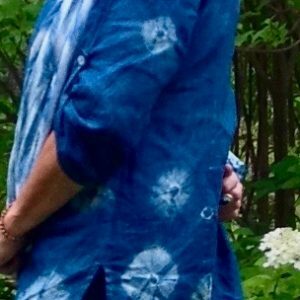 I used this fiber for many of my indigo experiences at this workshop. 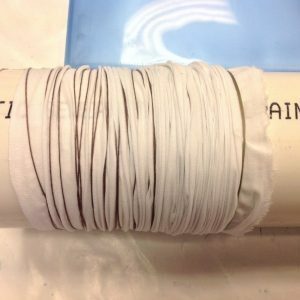 It took the dye nicely and due to it’s strength and texture, I knew it could be used to make various useful items. The next step was trying several clamping techniques, using geometric forms, that were made from wood and plastic. 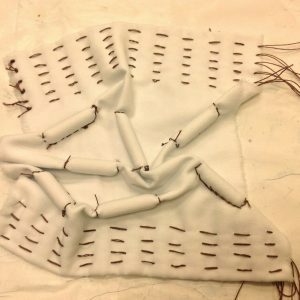 Over the course of the week, we learned various stitching and shibori techniques including: clamping, pleating, arashi, nui, and kumo. Each technique yielded different results. I was drawn mostly to arashi, nui and kumo. 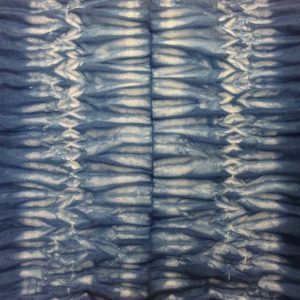 One day, Harriet brought in several large pieces of Japanese indigo shibori, to show us master works. The colour was almost black and the shibori techniques, well they were meticulous! She told us that because many of the pieces had been dipped up to 100 times in the Indigo vat, such dark colours are achieved. Hours of painstaking work. But the results were exquisite. The Haliburton School of Arts has 3 campuses, with our workshop taking place in an Elementary school. On the evening before the last course day, the classrooms and studios were opened to the public, for an Open House. We displayed some of our pieces on the walls of the classroom. The response from the people who came through was very positive, both in the quality of what we had produced and the amount of work done, in such a short period of time. 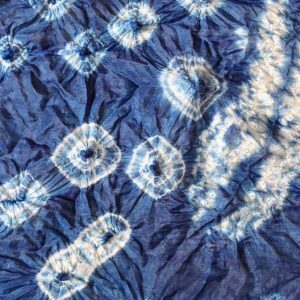 As a result of the success of this course, I am encouraged to continue learning more about indigo shibori and how to maintain an indigo vat.